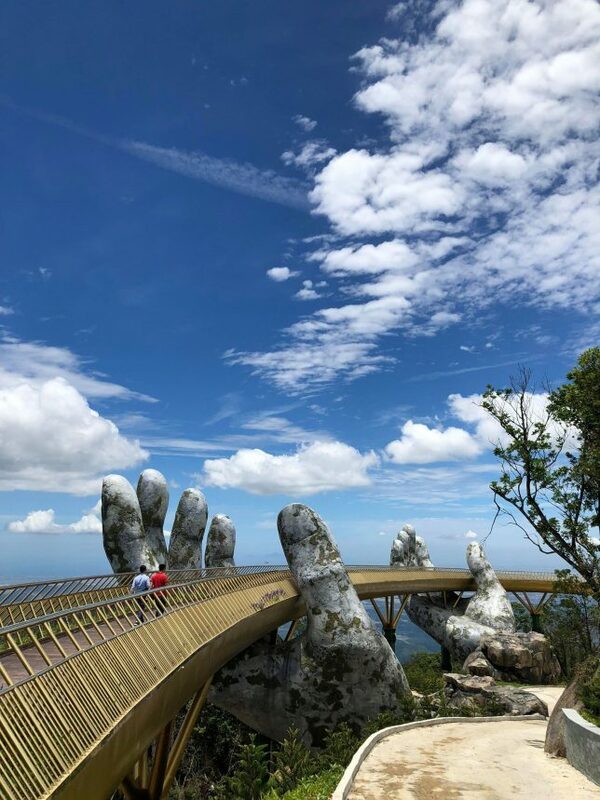 You’re in good hands when you walk the recently opened Golden Bridge in the Ba Na Hills – two humongous hands carved from stone, to be exact. Some say driving in Vietnam is a gripping experience… don’t even ask about walking. Until now, that is, and for that we can thank the eye-popping, jaw-dropping, finger-lickin’-good (OK, don’t try licking these fingers) Golden Bridge. 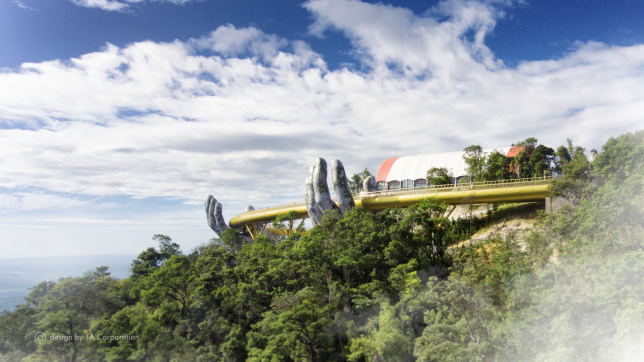 The 150-meter (just under 500-ft) long pedestrian walkway forms a nearly-closed loop, offering visitors a leisurely yet visually-enriching route from the resort’s cable car station to the lush Avatar Gardens. 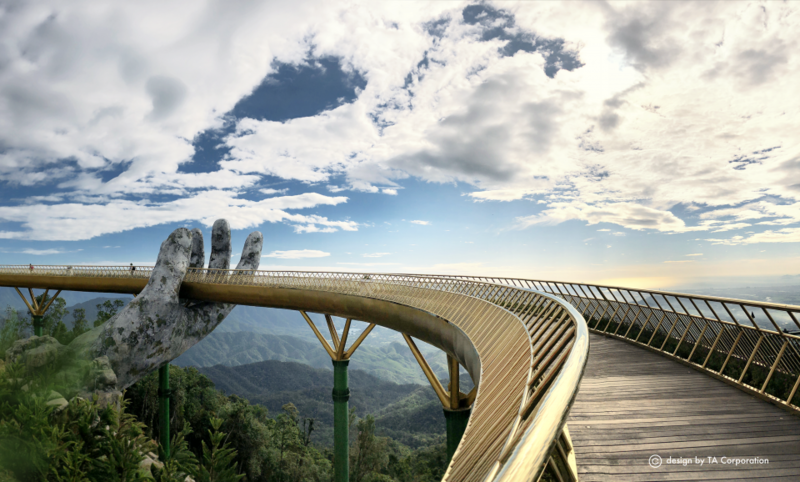 The Golden Bridge was commissioned by resort-owner Sun Group and is set among the scenic Ba Na Hills about 40 km (25 miles) west of Da Nang. The concept can be credited to Vu Viet Anh, principal designer and founder of TA Landscape Architecture. According to Anh, the bridge takes the form of a suspended gold thread held aloft by a god’s mighty hands. Ba Na Hill Station was founded by French colonists in 1919. 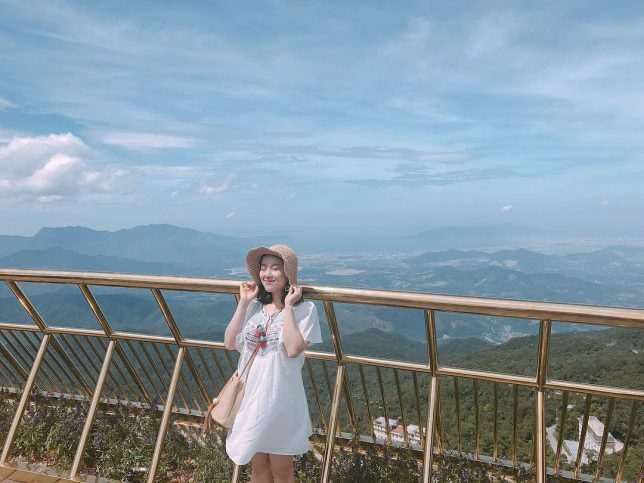 They chose the location, roughly 1,400 meters (about 4,600 ft) above sea level in the Truong Son mountains, for its cooler, fresher climate and spectacular scenic vistas. Accessibility was greatly improved in March of 2013 when the Ba Na Cable Car opened. The tram system is notable for holding the world record for the longest non-stop single track cable car at 5,801 meters (just over 19,000 ft) in length. 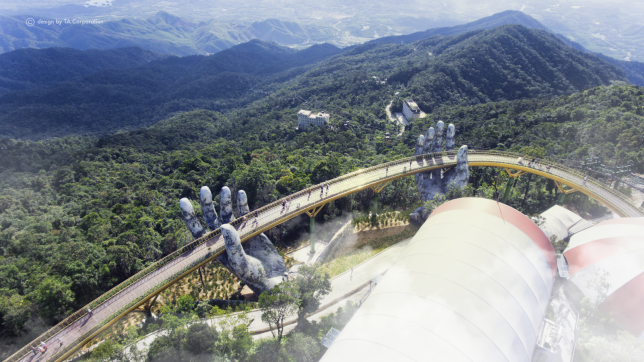 The Golden Bridge (“Cau Vang” in Vietnamese), which opened in June of 2018, was meant to supplement the cable car system and act as an incentive to the hospitality sector. 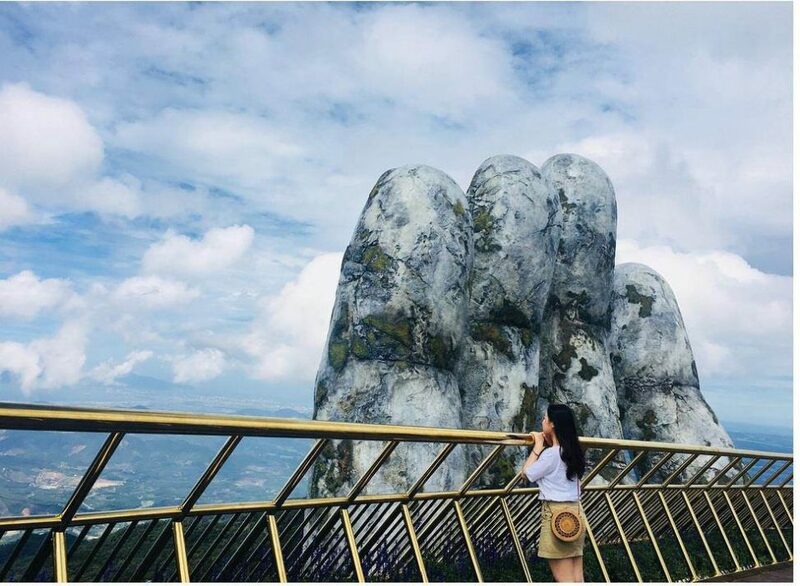 In recent years the government of Vietnam has endeavored to boost incoming tourism, especially from neighboring China, and offer that nation’s vacationers an appealing alternative to Thailand. 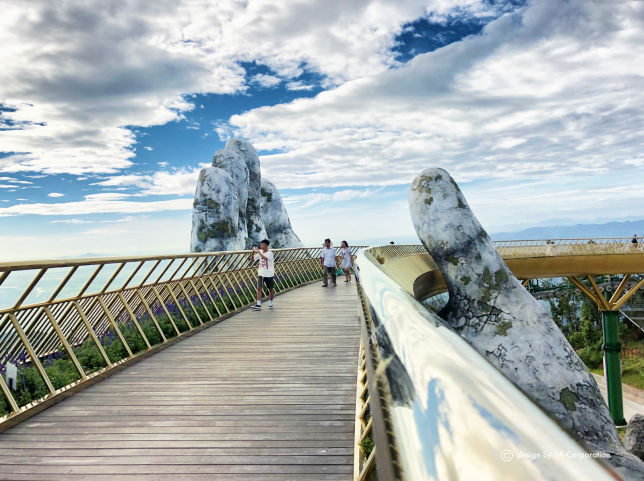 The 5-meter (16.5 ft) wide Golden Bridge’s outstanding features are the pair of enormous hands that support the walkway. They’re not actually carved from stone, by the way. Instead, they’re formed from fiberglass-covered metal mesh displaying a distressed appearance. Positive reviews of the Golden Bridge have so impressed the resort owners, they’ve already contacted TA Landscape Architecture for a follow-up project. 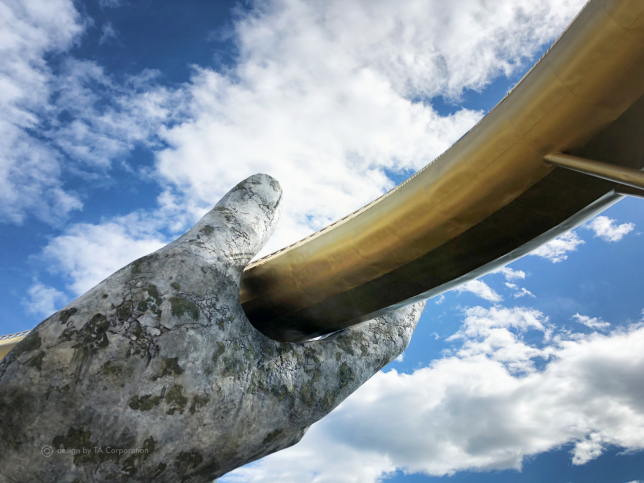 Details are scarce but, according to one source, an extension of the Golden Bridge in the form of a silver strand of a god’s hair will someday complement this heavenly bridge of gold.